Hello all! I am back for the Guided Math in Action Book Study, for Chapter 7! Conceptual Understanding- It seems as though we always hear to make teaching relevant to the real-world. But how often do we actually do it? We may think we do it every moment of every day, but that is not the case! When I was student teaching, our 4th grade team broke the classes into 5 different math groups. One group went to the Gifted/High Ability teacher and the other 4 groups were divided by need among the 4th grade teachers. Want to guess which group I had? Yep! The lowest! Boy, oh, boy, that was a learning experience. I had to keep everything at a bare minimum with these kids! I recall one lesson, where I had to teach elapsed time. They struggled with time, so we came together as a group and practiced the basics first. What time do we start school, What time do we eat lunch, What time do we leave, etc. Then we went back to the beginning and counted by hours to figure out how much time had passed. I used a large Judy clock to show the students, then they would count the time with me to figure out how many hours. Relating this to the students, so they they can grasp the concept of time, while relating it to their world helped them achieve success, when it was their turn to use clocks to practice. Problem Solving- In the past 4 years, our school "coaches" have said to make 1 day a week a focus on problem solving. ONE DAY?! How about EVERY day? This is something that I want to make sure we do! Our math series comes with a Problem of the Day, so I will be putting that to go use. However, I did not think about HOW they should be modeling their thinking. This was an eye-opener for me. 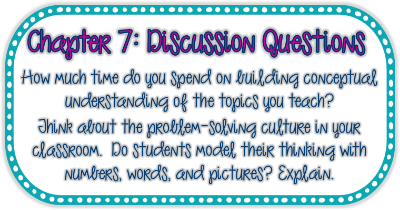 I tell students that there are many ways to solve problems in math, so they should be learning and using those ways. One of the items I want to incorporate into my classroom is using interactive notebooks. It would be great to have the students cut/paste a problem at the top of the page, with space to solve. On the bottom half of the page, the students can use numbers, words, and pictures to explain how they solved the problem. This is a struggle for students every year. (The explaining part of process). And it is ALWAYS on state tests, so practice we must! See you on Sunday for our next chapter. Only 2 more left! One more week before school starts! EEK!